And the treatment would only take Less than Half an Hour. Having an infected tooth is a painful, agonizing condition that requires immediate attention. Do not try to wait it out until it heals as this will only cause the infection to spread throughout your mouth infecting other teeth in the process. If left untreated, all of your teeth will become infected, decay, and eventually fall out for good. A tooth is considered infected when bacteria and plaque reaches the pulp in the canals of the roots. At this point a root canal procedure must be done in order to save the tooth from falling out if possible. We will remove the infected pulp and replace it with a special filling during this treatment. To prevent tooth infection from occurring in the first place, it is good to know how it is caused. The pulp mentioned previously is filled with blood and nerve tissue, which provides nutrients and oxygen to the teeth to keep them healthy. If you neglect to take care of your teeth, then the bacteria on the outer layers of the teeth will build-up until it dwells deep into the roots where it infects the pulp. Once the pulp is completely infected, the canals will only be filled with infectious material that will cause the tooth to fall out over time. It may also damage the supporting bones and gums around the tooth. Cracks and chips may quicken the infection process, so be sure to get those fixed up as well. 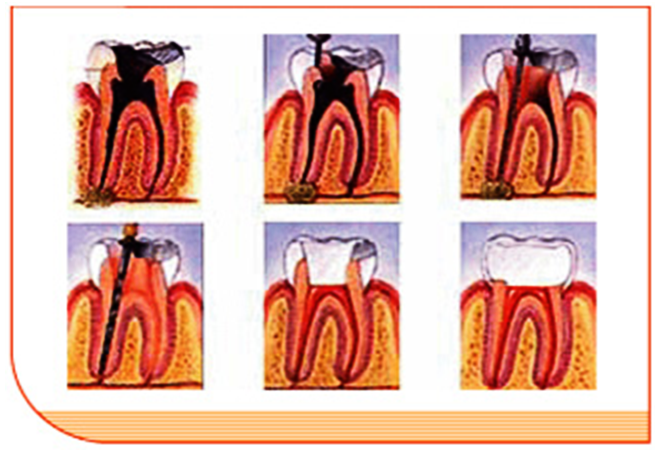 Standard root canal treatments can take 3 to 4 visits depending on the amount of infected teeth you have. Typically a local anesthesia will be used to numb the area being worked on, though if you visit us for sleep dentististry then stronger sedations may be used to put you into a deep sleep. There is another alternative though, a quicker and painless one known as Laser Root Canal treatment. The light from these special lasers will destroy more bacteria than a traditional treatment ever could since the light is able to reach all areas of the canal. It is a much quicker process and completely painless. After the procedure is done, it is best to avoid eating hard foods until the teeth fully heal. As you now know, you must brush, floss, and use mouthwash twice a day to prevent this problem from happening again. It is important to schedule a bi-annual cleaning as well. Contact us today to set up a cleaning or Laser Root Canal treatment. if you have any questions or would like to make an appointment .